MSD is continuing under a new name: MyShowDesigner. For more information, please see the 'Details' information for the downloads. It contains a full MSD 6 Pro™ setup, including fixture libraries etc. To see a full list of changes, please see the MSD 6 Version History.pdf document. Your current MSD licenses will continue to work with this new version, so no changes there. If you are currently using a Martin ShowDesigner version, and want to install a newer version, please read the next section carefully. The new MyShowDesigner version will be installed in a different location (C:\Program Files (x86)\Lighthouse Holland), and can be found in the menu as MyShowDesigner 6. Martin ShowDesigner used to be installed in C:\Program Files (x86)\Martin Professional, and could be found in the menu as Martin ShowDesigner 6. MyShowDesigner will store the MSD Standard Libraries in the same location as the Martin ShowDesigner (C:\Users\Public\Documents\MSD). We therefore advise you to first uninstall Martin ShowDesigner, and then use a full installer of MyShowDesigner to install the new version. Backup your MSD User files. Just to be sure, these should remain where they are. Backup any files that you might have stored in the MSD Standard Library folders. During install/uninstall these folders may be deleted and/or overwritten, that is why we advise not to store any files there yourself, with the exception of preliminary fixture libraries that you received from us. Uninstall your current Martin ShowDesigner 6 version. This will uninstall the MSD Standard Library folders as well. Download and install the latest full installer of your MyShowDesigner 6 version (Pro or Lite). This will install the latest versions of the MSD 6 programs including the MSD Standard Libraries. NOTE: If you want to retain the Martin ShowDesigner version for now, you can install both versions side-by-side, but they will share the MSD Standard Libraries. For this reason, if you want to remove either of the versions at a later date, you will have to re-install the version that you want to keep in order to restore the standard libraries. To install, unzip the file, run the Setup program and follow the instructions. It contains a full MSD 6 Lite™ setup, including fixture libraries etc. Here (at the end of the page) you can download a Demo version of the MSD 6™ 3D Visualizer. To be able to run this demo version, you will need to have access to the internet. This is needed to check the demo license (which is on our server). You will also need to register the demo for each computer you want to run it on (to get a License Code), which can be done from within the program, so just run it and follow the instructions. 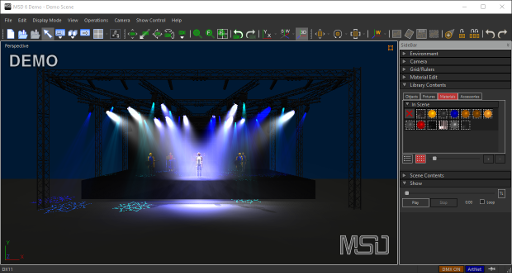 The MSD 6™ Demo can connect to Martin LightJockey, Martin M-PC (on the same computer) or a network ArtNet DMX source. You can easily select which source you want to follow in the menu (Show Control - Follow) and in the statusbar. To run Martin M-PC together with MSD Demo, start MSD Demo, then M-PC and load the training showfile. Once M-PC is running, press the MENU button at the top and go to the Add-ons tab. Press the 3D Visualizer button to make the connection. To run MSD 6™ Demo with an ArtNet source, make sure that the ArtNet source and the computer running MSD Demo are on the same network. The network part of both IP numbers should be the same. So for a netmask of 255.255.255.0 the first three numbers of the IP address should be the same, for a netmask of 255.255.0.0 the first 2 numbers of the IP addresses should be the same and for a netmask of 255.0.0.0 only he first numbers has to be the same. More content is available for registered users. If you are a registered user of MSD, then please log into make the extra content accessable.